Port Adelaide’s off season started early. 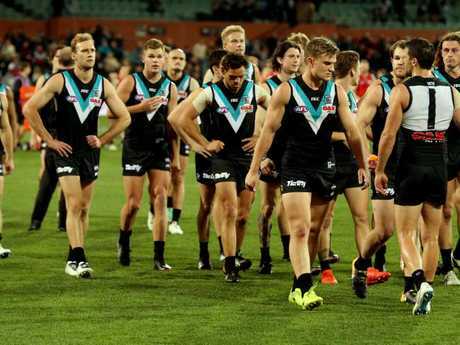 AS IF Port Adelaide's night couldn't get any worse, crowd violence broke out during the Power's season-ending loss to Essendon on Friday night. Footage of an Essendon fan fighting with a Port fan in the stands at Adelaide Oval was posted to social media. The video shows the Bombers fan holding another man in a headlock as he punches him while people try to break up the fight. Port has already been embroiled in incidents involving violence between spectators this year. Brawling supporters were caught on camera at Adelaide Oval after a loss to Geelong in April and there was reported violence in the stands at the Showdown against the Crows that same month. The ugly scenes on Friday night were a sour footnote to an already horrible experience for the South Australian side. Essendon's 19.9 (111) to 13.11 (89) win condemned the Power to an early holiday after looking finals-bound for much of the year. At one stage a top-four berth was a realistic possibility. Five wins on the bounce between rounds 12-16 propelled Ken Hinkley's men into fourth with an 11-4 record. Hopes of a possible premiership - or at least going deep into September - were front and centre in the minds of Port fans. But the dream soon turned into a nightmare. The Power lost six of its last seven matches to slide out of the top eight and watch its finals aspirations slip through its fingers. Needing a win over the Bombers - who were already out of playoff contention - and other results to go its way, Port couldn't hold up its end of the deal, leaving coach Hinkley shattered. "It's as wounded as I've felt, I reckon, in my time in footy," Hinkley said. "This footy club has let everyone down. "We're nothing tonight, we've got a lot of work to do. "If we as a footy club can't get harder together, we won't get to where we want to go." 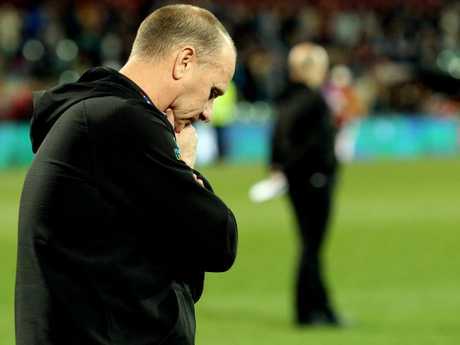 Port went off the rails in the latter half of the year, losing matches it shouldn't have. A nine-point loss to lowly placed Fremantle, a nail-biting three-point loss to the Crows and a four-point loss to West Coast preceded comprehensive beatings from Collingwood and Essendon. The defeat to the Eagles hurt more than most. The Perth side wasn't ahead at all until after the final siren, when Jeremy McGovern kicked a goal after marking with the last play of the game. It was a cruel result after West Coast knocked Port out of last year's finals with a goal after the siren. The loss to the Bombers means the off-season has come early for Port, who will have plenty of time to ponder where things went wrong. There were high expectations after the club picked up Jack Watts, Steven Motlop and Tom Rockliff during the trade period, but footy commentators have largely agreed Motlop is the only one of the three to earn a pass mark this season. Port has wasted a golden opportunity to play finals. "They were brought in to win a premiership," former AFL star Nathan Brown said of the trio on Fox Sports News. "Disastous scenes, when you've got that much talent on your list ... they should have been in the top four, Port Adelaide. They were flying along nicely." St Kilda great Leigh Montagna questioned where Port would go to from here after not winning a final in four years. 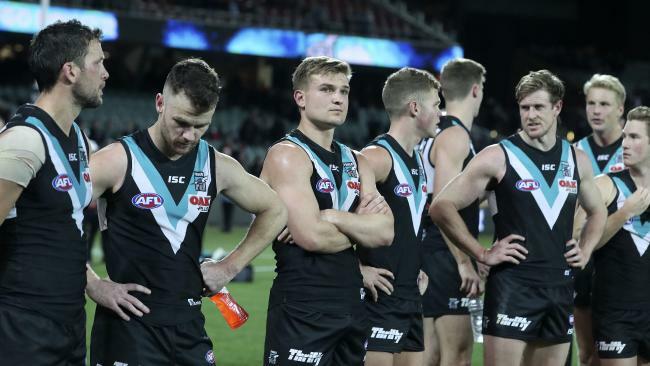 "I'm really worried about Port Adelaide going forward," Montagna said on Triple M. "What's become a theme now is they're consistently inconsistent. "It's four years now, they've only played finals once, and they didn't win that final. So they haven't won a final in four years." 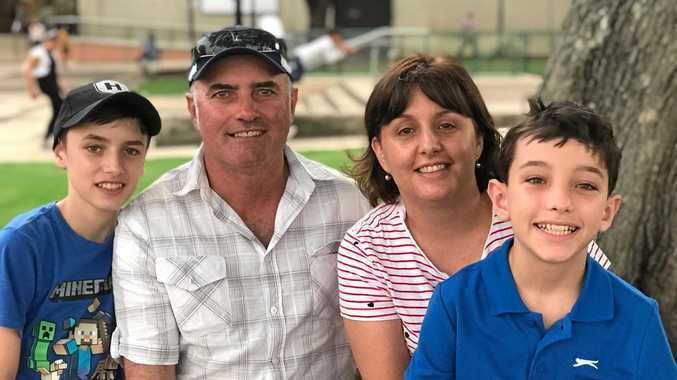 Assistant coach Brendon Lade announced on Saturday he was leaving the club for family reasons and to "explore other opportunities". And the future of gun wingman Jared Polec is still up in the air. Channel 7's Sam McClure reported Polec - who is out of contract at the end of the year - has been offered a five-year deal by North Melbourne worth about $700,000 a season. The 25-year-old is expected to challenge for the club's best-and-fairest award but chairman David Koch said a number of factors would be taken into account when considering how hard Port would push to keep Polec. "It depends on the price, how it affects your salary cap, it depends on your medical assessment," Koch said on ABC Grandstand. "That's up to our list managers to decide."